A few years ago, we attended an author event at Asheville’s Malaprop’s Bookstore located in downtown Asheville. 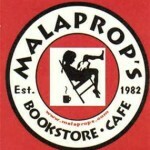 Malaprop’s is a cherished institution and draws a good crowd for their gatherings; including a program called Writers at Home with Tommy Hays. Tommy is an excellent writer and a close friend who I’ve known since tenth grade. The poet performing that day was Nancy Taylor. One poem, ‘Point Lookout’, impacted me in a way that sent me back to my childhood when my grandmother baked pies. 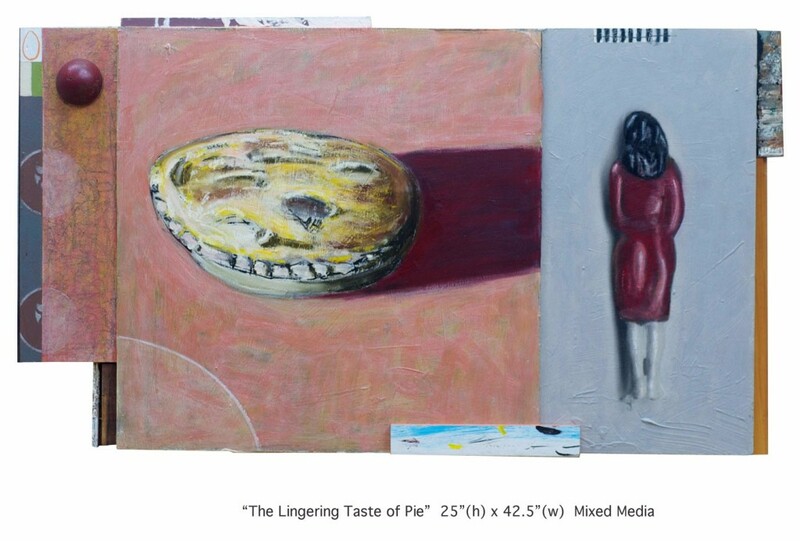 It was the inspiration for the painting above, The Lingering Taste of Pie. (This piece can be seen at Vortex Doughnuts in Asheville along with two others). I am always seeking a narrative to inspire new work. The words from the last stanza of her poem sent images buzzing in my head. Her Southern accent along with my desire to return to the South led me to this painting. One of my weaknesses is dessert; a seed planted long ago by my grandmother’s pies. between Old Fort and Ridgecrest. on slender iron rods, neon red. the crooked highway, we drool over what we’ll eat. when Mother demands to check our hair and hands. The odor of good grease hangs above flat, black grills. Sizzles never cease—burgers, bacon, sausage, hot dogs. triangles swathed in pastry contest-flaky. Two-inch high lemon meringue, sweet peach. on that grilled cheese. Ours waits pale, private. Her cap and apron smell snowy. through traffic with split-second timing. leading us safe into the dark of night. Nancy Dew Taylor, a resident of Greenville, SC, grew up in Lake City, SC, and spent summers in western North Carolina. Her publications include a book, Annotations of William Faulkner’s Go Down, Moses; short stories in The South Carolina Review and Sargasso, a Caribbean Journal; and poems in Kalliope, Appalachian Journal, Scribble, The South Carolina Review, Timber Creek Review, New England Watershed, and Tar River Poetry, and in A Millenial Sampler of South Carolina Poetry and several other anthologies. A gathering of books on diverse subjects that seem important to the educational benefit of the reader. A gathering of people who are drawn to peaceful coexistence and the realization that knowledge is more valuable than money. A place for readers who concern themselves with humanity and her development. A place where the best reads, the best company, and the best coffee complete the picture. A place where the books are the stars. A place where the reader and book meet and a journey begins.